When should you introduce solid foods to a baby? 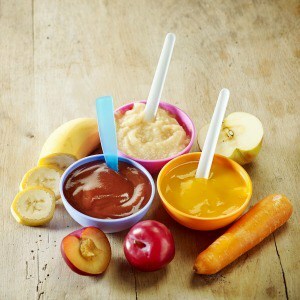 The Nightingales get tons of questions from new parents — or even second- and third-time parents — about how, when, and with what products to introduce solid foods. Here are a couple of our key answers. When should you introduce solid foods? This varies by baby. The general belief is 4-6 months. The American Academy of Pediatrics actually recommends the north end of that time frame — i.e. 6 months — while the AAP’s nutrition guidelines for its members says 4 months. Your baby’s digestive system is usually not ready for solids before the four-month mark, however. We suggest waiting closer to 6 months based on our own experience. How will you know when the baby is ready? It also teaches self-regulation, or stopping when you are full. To do this successfully, consider foods like ripe fruits, cooked egg yolks, flaky fish, moist and shredded meats, puffed cereals, and cooked pastas and vegetables to start. Also remember this doesn’t mean you’re off the hook — you still need to be there socializing with baby as he/she eats. What are some mashed baby food recipes I can use? Glad you asked. Here are 21 such recipes. What type of bib should I get? We are partial to BABYBJORN Rubber Bib, which comes in a variety of colors. What cookbooks should I consider buying?